Once a bird mainly of the south, mockingbirds are now found all over the U.S. The scientific name of the Northern Mockingbird is Mimus polyglottos, mimic of many tongues. It was so popular as a cage bird in the 1800’s that the east coast population was endangered. There’s a phenomenon called the “dawn chorus”. In the spring when birds sing the most, they are cued to sing by the amount of sunlight, some birds needing more or less than others. So at the first inkling of light, one species of bird starts to sing and as the sun comes up more birds begin to chime in, creating a dawn chorus. On cloudy and thus darker days, the dawn chorus begins later. 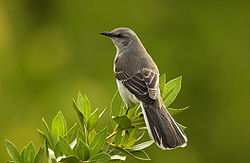 The Northern Mockingbird needs very little light to induce singing, so they are often heard on nights with a full moon. Mockingbirds are tolerant of humans, so they often nest in shrubbery near houses. They thus elicit occasional complaints from human inhabitants who are trying to sleep. Since there is no legal, safe, or ethical way of keeping the birds quiet, I suggest ear plugs – one of society’s greatest inventions. Mockingbirds do not actually mock or imitate other birds’ songs – it only sounds like it to us. Birds’ vocal chords are very complex as are their ear structure. Many songbirds can produce very sophisticated songs and they can distinguish more complicated sounds than we can. A few songbirds can even sing a duet with themselves! You may have heard people imitating bird calls – some sound very authentic- to us. I had students in my ornithology class imitate bird calls which I would record and then analyze with a sonograph – a machine that printed out the physical characteristics of the call. When I compared student imitations to the actual bird song, there was an enormous difference. Same with Northern Mockingbirds – although we may perceive one of their calls as that of another species, that other species can tell the difference. There are other species of Mockingbirds in the world but one that fascinates me is the Galapagos Mockingbird of the Galapagos Islands. Land animals there are very tame as there are no natural predators. The Galapagos Mockingbirds would often try to untie my shoelaces; why they did that is still a mystery to me.